Dallying In The Dirt, Issue #186 --- The Zucchini trombata is looking for a new place to hide. Does Mother Nature really not like me? Do I just irritate her with my conflicting requests? My little corner of the world was actually getting anxious for some rain. My weekend garden party starts with a bit of rain in the morning but it cleared up in time. The next day, I decided it was time to apply the Borax to the rest of the back yard turf and Ground Ivy mix. I did so. It then immediately rained. Not enough to really soak the ground but enough to wash the Borax off the leaves of the Creeping Charlie. We are supposed to apply it when it is cool and the weed is rapidly growing. We have now had three of the hottest days of the summer. It must be September. I just looked and the Ground Ivy is starting to turn brown at its edges so maybe M. N. is not really being mean but just teasing me. 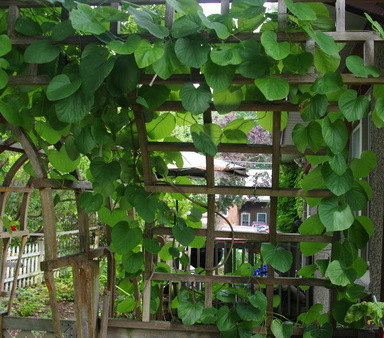 She also organizes the growth of my Aristolochia sp or Dutchman’s Pipe vine. It has very large leaves that create a dense screen. I have it planted to block the view between my deck in the back yard and the little side yard deck. It took its sweet time starting this spring but it has taken off with a vengeance. It is up the arbour, across the top of the trellis, running along the bottom of the trellis and up the pole on the other side. Lots of large green leaves. It did not grow in the middle of the trellis, leaving a nice clear view between the two decks. I tried to train it. It ignored me. I will prune and train more carefully next year and see if Mother Nature will accommodate me. The late warm weather is providing more Tomatoes then we can eat but it’s time to make my famous Spaghetti Sauce so they can certainly contribute to that pot. It is the best way to preserve the excess from the garden. Onions, Peppers, Carrots, some Celery and whatever else we have a surplus of, all go into the pot and then we freeze the finished sauce in portion sized packages to be enjoyed on cold winter’s nights. The Zucchini in all its forms is also producing madly. 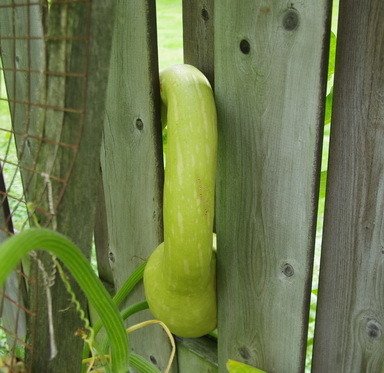 I really do like the amazing climbing Zucchini, Zucchini trombata, that I get from Renee’s seeds. It grows at least 15 ft in a season and will climb over anything that it finds. The young small fruit are delicious and all of the seeds congregate in the small bulbous end leaving the rest of it seed free. Occasionally we miss one and they quickly turn into monsters. This year the monster was trying to hide. It grew out between the slats of the fence and then turned and came back home. I’m not sure how I’m going to extract it, probably in several small pieces. The garden is endlessly fascinating. Yesterday, on one of the warmest days we have experienced, I noticed a little surprise in one of the front beds. A bright white flower had appeared from nowhere. Despite the heat, the first of the autumn flowering bulbs have pushed up a flower to remind us what is coming. 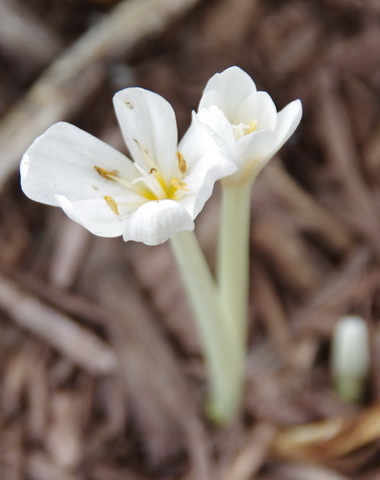 It seems to be a small white Colchicum and I do remember planting a few, although I’m not sure that I remember where I planted them. It has the six stamens indicative of Colchicum but it is rather small. Do I recall seeing any of its leaves there this spring? It is time to start wandering the garden centres and looking for the newest and best flowering bulbs. Yes, most of them flower in the spring but there are a few autumn flowering types and we need to get them into the ground as early as possible so that they will grace us with their presence this year. Some garden centres keep them refrigerated to make sure they don’t bloom before they are sold and planted, which Colchicum will certainly do. Wendy Asks? I live in Ontario, between Fergus and Orangeville, in zone 5b, I believe and I have many varieties of daylilies in my garden as I love them. I've seen something unusual happen to a few of them(all in the same area) the last couple of years. The colour in the flowers are bleeding and getting streaky. Some of the buds have small bumps on them too. Plus some plants are showing an orange rust at their base and on the stalks. These are all good quality stock and some are 7 years old. Could it be a result of the weather conditions? The plants are somewhat close together (and could use some dividing), so I'm wondering if it's poor air circulation that could be causing this as well. Last year, after some research, I thought it might have been thrips causing the problem but I thought they died over the winter. I'm concerned that it will spread to all of my other plants. Have you ever seen this? Anne Asks? Why are my raspberries not ripening this year? The fruit has formed on the branches but have not ripened since they formed earlier in the year. Ken Answers! This is one of those questions that is very difficult to answer as there could be many answers. Raspberries need a good supply of water in order to ripen and if it was dry in your area at that time of year, then that could be your problem. Too hot, too cold, not enough sun, any or all of those things might have some effect but my best guess would be the lack of water at the critical time. I run a soaker hose the length of my Raspberry bed and use it regularly during fruit ripening time.